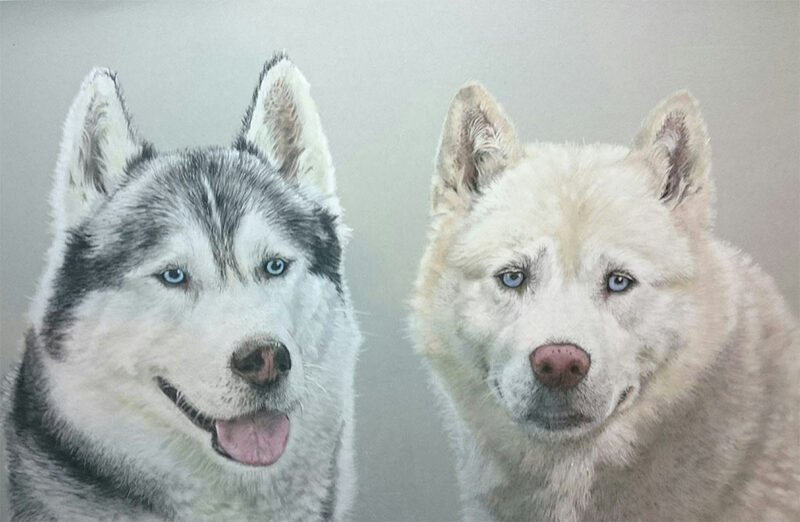 Finished this beautiful painting of two wonderful dogs called storm and spirit. Using pan pastels, inscribe soft pastels, Jacksons handmade soft pastels and Derwent pencil pastels all on velour. Measuring 20 x 27 inches. Hi, I’m Steve Morris of Bewdley Pet Portraits. My pet portraits art studio has been growing substantially over the last 4 years with more and more commissions for all sorts of pet dogs, cats and horses. If your pet has captured your heart let me capture their portrait in a pastel art piece which you will treasure forever. I take and accept Pet Portrait commissions from all over Worcestershire the West Midlands, UK and have crafted several Pet Portraits for International clients. My pet portraits usually take 3 to 4 weeks to create and we will liaise throughout the entire process.